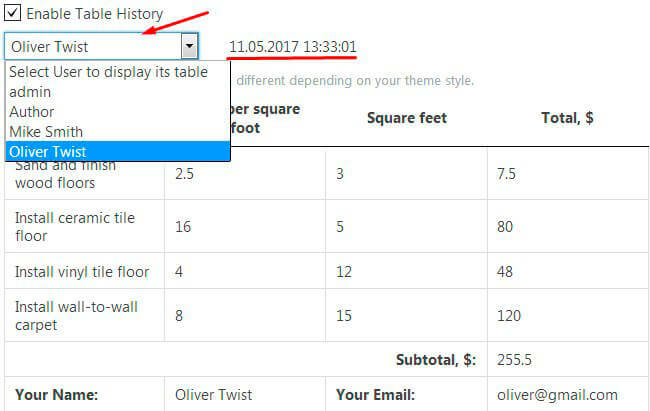 Table History feature is very useful option that allows you to create editable tables for your logged in users and easily view the changes. It is PRO feature and you can find it on the main settings menu of your Data Tables plugin. To activate – click on Enable Table History checkbox. Go to Settings -> Features. Enable Save Editable Fields, Use Editable Fields for Logged In Users Only and you can also enable an additional feature – Use Editable Fields for Current Roles options (choose roles). Note: you can edit users personal role on Users tab (admin WordPress panel). Each of your user will be able to edit your table. Information about table changes will be displayed on History Table tab, where you can select user from available list to check it. Also here you will find date and time changes.